Over the weekend, I watched George Romero’s favorite film, Tales of Hoffman. 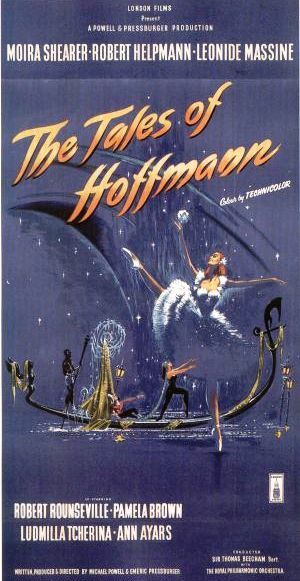 Released in 1951, Tales of Hoffman is an operatic re-telling of three romantic misadventures (along with a framing story) of the eighteenth-century poet E.T.A. Hoffman. Whenever he is interviewed, Romero makes a point to talk about Hoffman and the impression it made on him as a young director. I was curious to see if I could detect how it might have influenced his zombie films (if at all). The Criterion Collection edition of Hoffman also includes an interview with Romero in which he expounds upon the influence of the film in his work, and tells several amusing anecdotes. Would a typical zombie fan enjoy this film? I do not even dare to conjecture! Though not normally a fan of ballet, the clip was bizarre and creepy enough I may end up going in search of that one.